The Creatures Online Official Website is the official website for Creatures Online, run by Fishing Cactus and BigBen Interactive. Prior to the site opening, it had a teaser picture of Norns hatching, and you could sign up for the site newsletter. On its second day of existence, the site went down - this was fixed later. 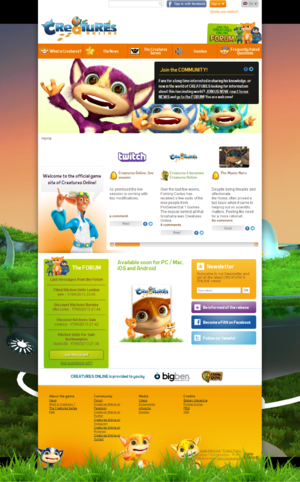 The website was known as the Creatures 4 Official Website until May 2013, when Bigben partnered with ProSiebenSat.1 Games, changing the game's name to Creatures Online. The website went down on 12 February 2016, but was reopened later, with Chris announcing Creatures Family in a forum topic on 9 March 2016. What is Creatures? - An introduction to Creatures Online and Sphericus. The News - Reposted content from the Fishing Cactus blog, a new interview with the game designers. The Creatures Series - An introduction to the games in the Creatures series from Creatures 1 through to Docking Station. Goodies - Official teaser video, Artwork, Screenshots, Wallpapers. The Fan Kit is a zip file of all the wallpapers and screenshots available in the Goodies section. Forum - You can sign up with your Facebook account or make up a nickname for use. The forums that are provided are French and English. The administrators and moderators of the forum are Master Shee, Yoann, Lord Shee, Sébastien, Andrea Di Stefano, Bruno Urbain and Modyo. There is also a user level called "Ambassador" - members of the Creatures Community with limited moderating powers on the Creatures Online forums. The Creatures Community Ambassadors are Don, Jessica, Laura, ChosenPredator and Rascii. This page was last modified on 12 March 2016, at 17:56.